Time really does fly. It’s been two months since either of us have had the time or energy to post anything. Jim has been flying back and forth from Nashville to Boston for work at a client site in northern Massachusetts. He’s also been doing assignments for his online classes as he works toward a second Master’s degree. Despite all of that, Jim found time to continue his personal care: getting labs done, medical check-ups, and an eye exam, that included new glasses. In addition, he needed to be around for us to get the camper into the RV repair shop for maintenance that had to be performed there. I, too, had lab work done, a medical check-up, and an eye exam. I also threw in a massage for good measure. All of this continued during the latter half of the month of July while in Green Acres in Savannah, Tennessee. Something else happened while in Savannah related to my Mom that wasn’t exactly expected even though we’ve stayed in and around Middle Tennessee for almost the entire last 12 months due to Mom’s health concerns. On July 20th, Mom went back into the hospital for the 3rd time since March. On August the 4th, Jim and I moved the camper to Clarksville, Tennessee, as planned. While Jim worked, I was going to help our youngest son and his wife. Nathaniel and Rachel have a little boy who turned 2 in June, and another little boy was due August 6th. 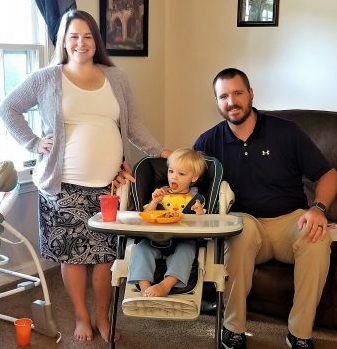 The week before we moved to Clarksville, Rachel learned she’d need to have a C-section, so my help was not just desired, it was required; she’d not be able to lift anything heavier than the new baby for 6 weeks or so. It was an intense, busy, and blessed time. While Rachel and Marshall were in the hospital still and I was home with the toddler, I learned that Mom would be discharged, but she was going to need more care than she could get at the assisted living facility in which she had been living. Thankfully, Rachel’s Mom, Susan, had made plans to come up the day we expected Rachel to come home from the hospital and to stay the next day as I had an annual medical appointment in Nashville. (Susan would come up again the following week, so I could go to another annual check-up in Nashville, also.) My brother and I had to tag-team getting things ready for Mom to move into a different assisted living facility, one that could provide a greater level of care for her specific needs. We got Mom settled, and I then went back to help the young family. My brother made periodic visits to see and check on Mom while I helped in Clarksville, which was about a 3-hour drive from Mom’s new home. Jim and I had a good time with the family in Clarksville. When Jim was home on weekends, he spent as much time with us as he could. He and I took Hershel to the local Farmer’s Market a couple of times; we got hair cuts together, and he visited and played at their house. When Jim was in town and Nathaniel was home with his family on weekends, Jim and I found time to do some fun things. He and I went to a matinée movie followed by dinner one weekend, and another weekend we ate pizza at a new-to-us restaurant before playing 3D Blacklight Mini Golf. On September 1st, Jim and I moved the camper to Ethridge, Tennessee, seven miles from Mom’s new assisted living location. Rachel’s Mom would come to help until the doctor gave Rachel the all clear to continue without restrictions. Mom’s health had declined greatly in the last year, and especially in the last couple of months. Jim and I extended our stay in Ethridge beyond the month originally planned, so we’ll be here for many weeks yet. The day after we arrived in Ethridge, I visited Mom and found her not well with what we soon learned was shingles. That week, Mom was refusing to eat or drink much of anything. The medical doctor had put her on medications for the shingles and pain; he advised an eye exam since the blisters were on her face and circled her “good” eye. Thankfully, no blisters were found in her eye, but the optometrist put her on anti-viral drops as a precaution. Friday and Saturday of last weekend, Mom had 3 falls in 36 hours, which resulted in 2 ER visits; the latter led to her being admitted. Though sore and bruised from her falls, she was admitted for a UTI (urinary tract infection) and dehydration. Her behaviors while at the hospital demonstrated further decline, too. You see, along with her medical issues, Mom has dementia. The official diagnosis is dementia with psychotic behaviors. It was the worse I’d ever seen. It took 5 nurses and me to get her transferred to a bed in a regular room. When Mom’s problems with UTI and dehydration were better, she was transferred to a senior psychiatric hospital where she is now. I met with her care team there day before yesterday. All of the medical professionals who have seen and examined her in the last 10 days seem to agree that Mom’s behaviors and her mental decline make her a danger to herself and others. These issues along with her other physical care needs are beyond what can be handled in assisted living, and attempting to figure out something in a home environment is not recommended due to her behaviors. I am going to be exploring our options to find the best fit for Mom. It is a sad time for all of us. Living a full-time RV lifestyle doesn’t make us immune from the things life throws our way, but it does give us flexibility to go where we need to be when we need to go during difficult times. It also provides us joy in the midst of challenging times since it is a lifestyle in which we find pleasure. Jim and I don’t know what will come next. He does his work, for income and for his degree, while I care for family and our home. One day soon, we’ll be back to where we can do as we had been doing, but for now, we are doing what we need to do.